Let me first start off by saying, I’m pretty active. I do high intensity workouts, I jump rope, and, of course, I do a lot of yoga. But none of that prepared me for my first Crossfit class. But do not let that scare you! I absolutely loved the class and, even better, got a great workout. I went to Crossfit MPH’s intro class back in February. I was in a class with three other people, which was great because we all were able to get feedback on our technique and any issues we had during the workout. Head coach, Rebekka Ellman, gave us a quick ten minute overview of Crossfit, and we went right to work. Always important, we started off with a quick warm-up, and then were taught four basic Crossfit movements: a squat, a press, pushups, and burpees. We spent between 5-10 minutes working on each movement because in Crossfit, form is everything. This is because when the pace is sped up and weight is added, it’s important to follow proper form to prevent injury. It was at this part in the class that I gained one of the most valuable lessons in my fitness experience…I’ve been doing squats wrong! Whenever I squat, my knees naturally go in. I’ve never been corrected on this before, despite the many fitness classes I’ve taken. As a result, and as an avid squatter, specifically the ballistic, plyometric kind, it doesn’t take much for my knees to take a beating. Because Rebekka really wanted us to get our form down, she corrected me each time I did it. Now whenever I do squats, I make sure that I’m actively pressing my knees out to prevent them from caving in. After going over key movements, we went over our WOD, or workout of the day. 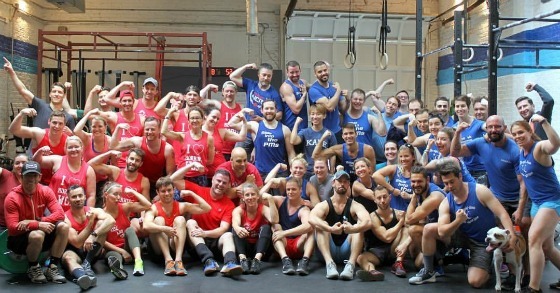 This is what makes Crossfit really unique. A WOD can be any length, and the challenge it poses is really up to the Crossfitter. For example, if you’re a beginner, you may reduce the weight or pace to make it more applicable to your skill set. While someone who is more advanced, can increase weight and go faster to make it more challenging for them. And for those who may get bored easily, Crossfit workouts change day to day. Some days, you may find yourself on a rower, and another day you may be doing pull-ups. Our WOD was pretty simple: a short run around the block, a few medicine ball squats, some shoulder presses, and burpees. It was a timed workout, so we had to do four rounds as fast as we could. Now, I said the workout was simple, but that doesn’t mean it wasn’t hard. And boy, was it hard. If you remember in the interview, I said that we ran outside and I didn’t have a coat. Grant it, I didn’t need it because I warmed up pretty quick, but running outside in the cold air was pretty hard. And I felt it a lot more than when I run in warmer weather. Coupled with weights, and I was done after three rounds instead of four. Despite this, I felt like I got a good workout and was pretty exhausted afterwards. I had a really great time doing Crossfit. It was fun and challenging. But what makes Crossfit really great are the coaches and the gym. Rebekka was an amazing coach, and she was really attentive, making sure each person felt like they were getting a private lesson. I couldn’t have asked for a better experience as a first-time Crossfitter. If this piqued your interest on Crossfit, check out my interview with Crossfit MPH head coach, Rebekka Ellman.